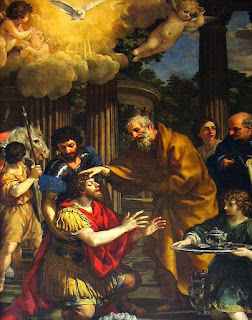 Saul of Tarsus had his revelation on the Road to Damascus and thereafter became the Apostle Paul who was one of the bedrocks of the early Christian Church. The Times recently reported on the death of another Saul, Saul Steinberg, the well-known corporate raider (“Saul P. Steinberg, 73, Icon of the Corporate Takeover,” NYT, 12/10/12). The death of Saul Steinberg comes on the heels of the publication of the Deidre Blair’s biography of Saul Steinberg, the artist. Deborah Solomon’s review of the book, Saul Steinberg: A Biography, was called “Drawing the Line and Crossing It,” (NYT, 11/21/12) because of Steinberg’s reputation as a serial Lothario. Apparently Steinberg, the artist, had as much trouble keeping his hands off women, as Steinberg, the corporate raider did companies. And Steinberg the artist and Lothario might have been amused to find out that his counterpart, according to the Times, “code-named his takeover targets after famous actresses, like Raquel Welch and Faye Dunaway.” There was a period during the 70’s when you could be having a conversation about Saul Steinberg at a Manhattan dinner party and depending what social milieu you were in, find you were talking about the wrong person— though it can be said that the literati were more cognizant of Steinberg, the raider, who controlled Reliance, then their counterparts in the business world were aware of Steinberg the artist. Reliance was after all a very big insurance firm. Well, as it happens, Reliance went down the tubes and Steinberg’s drawings live on. But neither Saul Steinberg, the raider nor Saul Steinberg the artist can be said to have had the kind of white light experience of their namesake, Saul of Tarsus. Neither Saul Steinberg saw Jesus.